The grounds around the tower are open year-round during normal Park District hours, and you are welcome to visit the grounds and listen to the carillon at any of the scheduled performances. Visitor Center admission is free of charge. Carillon tours are $3 for ages 5 and older; children 4 years and under are free. Visitors under 18 years of age must be accompanied by an adult. All tours are guided and only done during operating hours. Groups of 20 or more can make a reservation by calling 630-848-3619 or by e-mail at bmalatt@napervilleparks.org. Dates and hours of operation are subject to change due to weather and other factors beyond our control. Moser Tower is an open-air structure, and as such, visits can be impacted by weather. The Naperville Park District may cancel tours to the Tower if weather conditions pose any safety hazard to visitors and staff. Please consider this when planning your trip to the tower. Contact the Park District on the day of your visit if you have any doubts about the weather's impact on tours. But at 14 stories high – and about 10 feet taller than the Statue of Liberty – the hike to the open-air Observation Deck poses some physical challenge; mental, too, if you’re sensitive to heights. The reward, however, is a one-of-a-kind vantage of the city, the Riverwalk and Centennial Beach, and on clear days, the Chicago skyline. “Moser Tower is designed for everyone to enjoy, and we wholeheartedly encourage the public to come and explore the interior of Naperville’s latest downtown jewel regardless of physical limitations,” said Brien Nagle, chairman of the Millennium Carillon Foundation. The hike to the top of Moser Tower, from ground level to the Observation Deck, is roughly equal to walking up the stairs of two of the Van Buren parking garages in downtown Naperville stacked on top of each other. 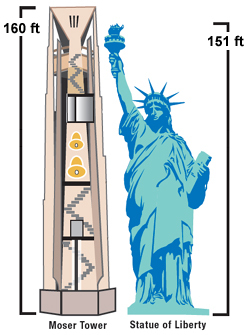 Should a visitor need to take the elevator up to the first half of the tower, the climb to the Observation Deck would be about equal to walking up the Van Buren parking garage stairs from top to bottom. The stairs are enclosed by railings 4-1/2-feet high, a secure barrier for children and adults, but as you climb past the Carillonneur’s Cabin, the wide concrete walls that form the base of Moser Tower begin to dwindle away. The upper reaches are more open and airy, something to be considered by people who are sensitive to high places.